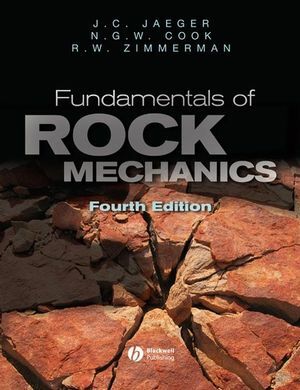 Widely regarded as the most authoritative and comprehensive book in its field, the fourth edition of Fundamentals of Rock Mechanics includes new and substantially updated chapters to this highly praised text. Unavailable for many years, now back by popular demand. John Conrad Jaeger received a first-class honours degree in mathematics and physics from the University of Sydney, was Wrangler (class I) in the Mathematical Tripos at Cambridge, and received a DSc in applied mathematics from the University of Sydney. He was a professor at the University of Tasmania and the Australian National University. He was the author of several monographs in applied mathematics, including, with H. S. Carslaw, Conduction of Heat in Solids, and was a Fellow of the Australian Academy of Science and the Royal Society. Neville G. W. Cook received a BS and PhD in geophysics from the University of Witwatersrand. He was the founder and first director of the Mining Research Laboratory of the South African Chamber of Mines, and in 1971 he received the Gold Medal of the Scientific and Technical Societies, the highest scientific award in South Africa. He was Donald H. McLaughlin Chair in Mineral Engineering at the University of California at Berkeley, and was a member of the U. S. National Academy of Engineering. Robert Zimmerman received BS and MS degrees from Columbia University, and a PhD from the University of California at Berkeley. He has been a staff scientist in the Earth Sciences Division of the Lawrence Berkeley National Laboratory, and Reader in Rock Mechanics at Imperial College, London. He is currently Professor of Engineering Geology at the Royal Institute of Technology in Stockholm, and co-editor of the International Journal of Rock Mechanics. He is also the author of the monograph Compressibility of Sandstones. 1. Rock as a Material. 1.4 The fabric of rocks. 1.5 The mechanical nature of rock. 2. Analysis of Stress and Strain. 2.2 Definition of traction and stress. 2.3 Analysis of stress in two dimensions. 2.4 Graphical representations of stress in two dimensions. 2.5 Stresses in three dimensions. 2.6 Stress transformations in three dimensions. 2.7 Mohr’s representation of stress in three dimensions. 2.8 Stress invariants and stress deviation. 2.10 Infinitesimal strain in two dimensions. 2.11 Infinitesimal strain in three dimensions. 2.12 Determination of principle stresses or strains from measurements. 2.14 Stress and strain in polar and cylindrical coordinates. 3. Friction on Rock Surfaces. 3.3 Friction on rock surfaces. 3.5 Sliding on a plane of weakness. 3.6 Effects of time and velocity. 4. Deformation and Failure of Rock. 4.3 Effects of confining stress and temperature. 4.7 Effects of pore fluids. 4.8 Failure under true-triaxial conditions. 4.9 The effect of anisotropy on strength. 5.2 Stress-strain relations for an isotropic linear elastic solid. 5.4 Hooke’s law in terms of deviatoric stresses and strains. 5.5 Equations of stress equilibrium. 5.6 Equations of stress equilibrium in cylindrical and spherical coordinates. 5.8 Elastic strain energy and related principles. 5.9 Uniqueness theorem for elasticity problems. 5.10 Stress-strain relations for anisotropic materials. 6. Laboratory Testing of Rocks. 6.5 Stability and stiff testing machines. 6.7 Diametral compression of cylinders. 6.8 Torsion of circular cylinders. 7.4 Constitutive equations of poroelasticity. 7.5 Equations of stress equilibrium and fluid flow. 8. Stresses around Cavities and Excavations. 8.2 Complex variable method for two-dimensional elasticity problems. 8.3 Homogeneous state of stress. 8.5 Circular hole in a rock mass with given far-field principal stresses. 8.6 Stresses applied to a circular hole in an infinite rock mass. 8.7 Stresses applied to the surface of a solid cylinder. 8.8 Inclusions in an infinite region. 8.9 Elliptical hole in an infinite rock mass. 8.10 Stresses near a crack tip. 8.14 Interactions between nearby cavities. 9.4 Circular hole in an elastic-brittle-plastic rock mass. 9.6 Flow between flat surfaces. 9.7 Flow rules and hardening. 9.11 Some simple viscoelastic problems. 10.2 Effective moduli of heterogeneous rocks. 10.3 Effect of pores on compressibility. 10.4 Crack closure and elastic nonlinearity. 10.6 Sliding crack friction and hysteresis. 10.7 Griffith cracks and the Griffith locus. 10.8 Griffith theory of failure. 10.9 Linear elastic fracture mechanics. 11. Wave Propagation in Rocks. 11.2 One-dimensional elastic wave propagation. 11.3 Harmonic waves and group velocity. 11.4 Elastic waves in unbounded media. 11.5 Reflection and refraction of waves at an interface. 11.6 Surface and interface waves. 11.8 Effects of fluid saturation. 12. Hydromechanical Behavior of Fractures. 12.2 Geometry of rock fractures. 12.3 Normal stiffness of rock fractures. 12.4 Behaviour of rock fractures under shear. 12.5 Hydraulic transmissivity of rock fractures. 12.7 Seismic response of rock fractures. 13. State of Stress Underground. 13.2 Simple models for the state of stress in the subsurface. 13.3 Measured values of subsurface stresses. 13.4 Surface loads on a half-space: two-dimensional theory. 13.5 Surface loads on a half-space: three-dimensional theory. 13.7 Other stress measurement methods. 14.3 Overthrust faulting and sliding under gravity. 14.6 Beam models for crustal folding. On this page you'll find links to the artwork from Fundamentals of Rock Mechanics, Fourth Edition. This file is stored in a ZIP archive. If your computer is not capable of opening ZIP archives, you can download a trial version of WinZip at WinZip.com.